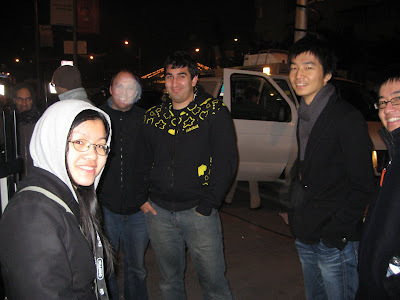 Here are the first shots of the Macworld madness, taken at 5 a.m. local time this morning. Hundreds of Apple faithful have been camping out in the streets around Moscone Center since last night. The brisk morning air is redolent with the odor of reefer, patchouli oil and nerd body funk. TV trucks are parked outside interviewing idiots and asking them what we’re going to announce today. The Starbucks on 4th Street has a line halfway down the block. Even the filthy hacks in the press corps have started lining up early. There’s pizza, Krispy Kreme donuts and lots of coffee. Sleeping bags and mats and folding chairs and pieces of cardboard, piles of fat geeks sprawled on the pavement — it looks like a homeless convention. Overall I think it’s about the ugliest single group of human beings I’ve ever seen in one place. 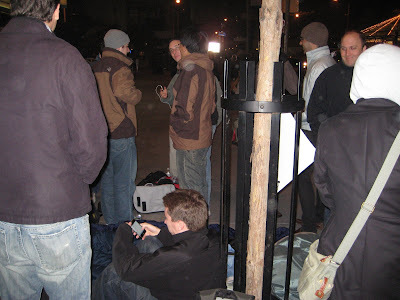 In the regular attendee line, a group of about 40 spoiled Google brats (above and below), with their typical sense of entitlement, showed up early, pitched a huge tent at the front, then took turns rotating in and out of line all night, working in shifts. When the doors open they’re all going to crash in together — and they think this is perfectly okay. The fucks. Moshe will deal with you all later. Controlled substances appear to have been plentiful. 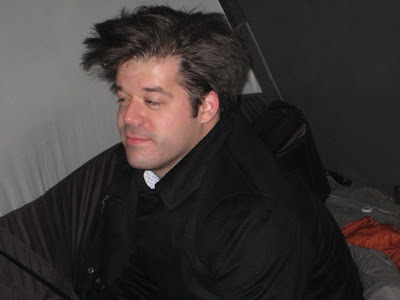 This guy works at Google and claims he was just “sleepy.” Nice hair, Morrissey. 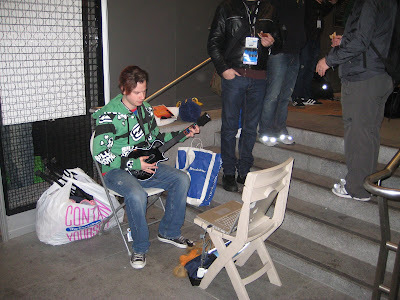 Naturally there was a dude in the front of the line playing Guitar Hero on a MacBook and being very solemn about the whole thing. You knew there would be, right?